Answer: Hairdresser --> shears, drier. Winner: Jeff Merritt of Sudbury, Mass. Next week's challenge, from listener Darrell Myers of Somerville, Mass. : Name a famous actress of the past — first and last names, 10 letters altogether. Change one letter in the first name and one letter in the last. The result is a two-word phrase naming a food item often found in a kitchen cabinet or refrigerator. What is it? If you know the answer to next week's challenge, submit it here. Listeners who submit correct answers win a chance to play the on-air puzzle. Important: Include a phone number where we can reach you Thursday, Oct. 13 at 3 p.m. ET. There's a big contest happening today, a battle of wits that will draw an audience of millions with immense pressure on the moderator to discern fact from fiction. It's time for The Puzzle. MARTIN: I am joined by the puzzle editor of The New York Times and WEEKEND EDITION's puzzle master Will Shortz. WILL SHORTZ, BYLINE: Good morning, Rachel. So you're the moderator today. MARTIN: I'm the moderator. Discerning fact from fiction, not envying the moderators of tonight's presidential debate - tough times ahead. SHORTZ: Not at all, yeah. MARTIN: OK. Remind us of last week's challenge. SHORTZ: Yes, it came from listener Lowell Beineke of Fort Wayne, Ind. I said, name an 11-letter occupation starting with H. I said, if you have the right one, you can rearrange the letters to name two things a worker with us occupation uses, one in six letters and one in five. What occupation is it? Well, the answer is hairdresser. You can rearrange those letters to make shears and dryer. And dryer uses the alternative spelling of the word, D-R-I-E-R.
MARTIN: OK. So a whole lot of you got the right answer this week. Our randomly selected winner, though, is Jeff Merritt of Sudbury, Mass. He's on the line now. Hey, Jeff, congratulations. JEFF MERRITT: Hi, Rachel. How are you? MARTIN: I am well. How'd you figure it out? MERRITT: It was the first 11-letter H occupation that popped into my head. MERRITT: But I didn't submit the answer right away because I wasn't sure about that spelling of dryer. MARTIN: Oh, really? So - what? - you just, like, sat on it for a couple days? MERRITT: Tried to think of another thing that worked and then decided - no, no, it had to be hairdresser. MARTIN: And tell me about Sudbury, Mass. What do you do there? MERRITT: I'm a preschool teacher. MARTIN: Oh, you are? Little people. MERRITT: ...You know, my name starts with the same letter as your name, or, hey, those two words rhyme. MARTIN: OK. So are you ready to play the puzzle? MARTIN: All right. Let's do it, Will. SHORTZ: All right, Jeff and Rachel, I'm going to give you clues for two words. Insert the consecutive letters L-I somewhere inside the first word to get the second one. For example, if I said bit of mischief and an instrument for measuring, you would say caper and caliper. MARTIN: You got it? OK. All right, fine. Yeah, let's do it. Sure. I'm good. SHORTZ: Number one is beginning, and your second clue is like the sky on a clear night. So it's the most obvious synonym of beginning. SHORTZ: Start and now insert an L-I to get like the sky on a clear night. SHORTZ: Number two, a variety of nut and a bird with a big bill. MERRITT: A bird with a big bill. SHORTZ: And it's going to to have an L-I in there somewhere. MERRITT: Yep. Not so good with birds. Pelican - pecan and pelican. SHORTZ: There you go. An evening meal and a source of goods. MERRITT: A source of goods and an evening meal. Supper and supplier. a wide area and Islam or Christianity. What Jesus was born in and to feign illness in order to escape work. MERRITT: To feign illness in order to escape work. I think I need a little help with this one. SHORTZ: A manger is right. SHORTZ: Plain to see and not aware of what's going on. Reduction in rank as major to captain and tearing down of a building. MERRITT: Tearing down of a building. It's not raise. MARTIN: So what - go back to the first one again. SHORTZ: It's got to be longer than that. SHORTZ: ...As major to captain. MARTIN: ...You're the vice president of sales and then, you're all of a sudden the sales clerk. MERRITT: Yeah, ha, you're demoted. MERRITT: I got there eventually. SHORTZ: And here's your last one. Change, as in a garment by a tailor, and what Peter Piper or Wee Willie Winkie is an example of. MERRITT: Alteration - I keep not getting the words long enough - and alliteration. SHORTZ: And alliteration - you got it. MARTIN: Oh, man. That took me a long time to get into the groove. Jeff, you did a great job. For playing the puzzle today, you get a WEEKEND EDITION lapel pin and puzzle books and games. You can read about your prizes at npr.org/puzzle. Where do you hear us, Jeff? MERRITT: I hear you on WBUR in Boston. MARTIN: Jeff Merritt of Sudbury, Mass. Hey, Jeff, thanks so much for playing The Puzzle. SHORTZ: Yes, the challenge comes from listener Darrell Myers of Somerville, Mass. Name a famous actress of the past, first and last names, 10 letters altogether. Change one letter in the first name and one letter in the last, and the result is a two-word phrase naming a food item often found in a kitchen cabinet or a refrigerator. What is it? So again, famous actress of the past, first and last names, 10 letters altogether. Change one letter in the first name and one letter in the last name, and the result is a two-word phrase naming a food often found in a kitchen cabinet or a refrigerator. What is it? MARTIN: When you've got the answer, go to npr.org/puzzle and click on that submit your answer link. Just one entry per person, please. And our deadline for those entries is Thursday, October 13 at 3 p.m. Eastern Time. Don't forget to include a phone number where we can reach you at about that time. And if you win, then we call you and you get to play on the air with the puzzle editor of The New York Times. 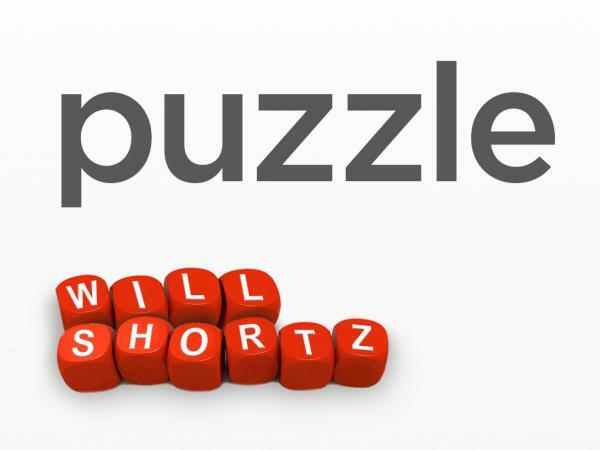 And he is WEEKEND EDITION's puzzle master, Mr. Will Shortz.